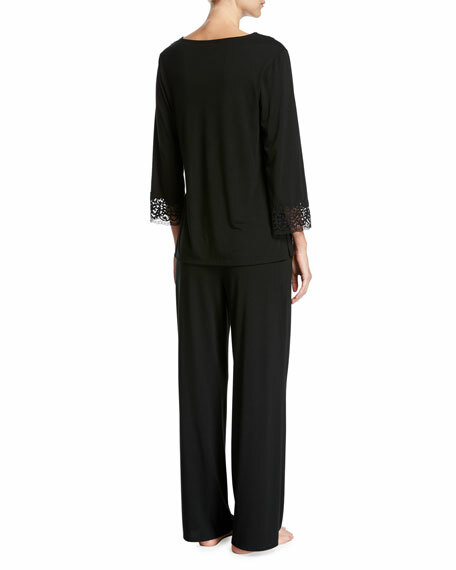 Embrace luxurious leisure with these Natori pajamas, featuring lace trim and soft modal jersey. Two-piece Natori PJ set in jersey with lace insets at neck and cuffs. Approx. measurements: Top, 18"L down center front; pants, 29" inseam. For in-store inquiries, use sku #2379986. Christine Designs "Bijoux" two-piece PJ set includes tank and shorts in satin with lace trim. V neckline. Adjustable shoulder straps. Flutter hem. Matching shorts. Body, silk; lace, nylon/cotton/spandex. Made in Canada. Dynasty multi-color people printed pajama. Stand collar; frog closures; red piping detail. Three-quarter bell sleeves. Drawstring waist; elastic back. Wide legs with slit cuffs. Polyester; machine wash. Imported. 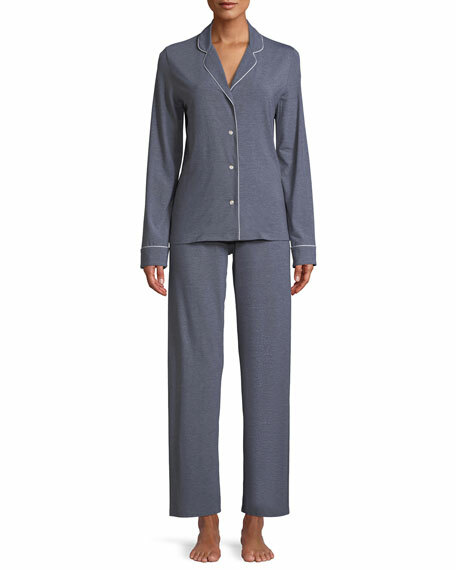 Natori sateen pajama set with contrast piping. Notched collar; button front. Bracelet sleeves. Patch pocket at left chest. Relaxed fit. Vented hem. Includes matching pants with drawstring pull-on waist. Cotton; machine wash. Imported.